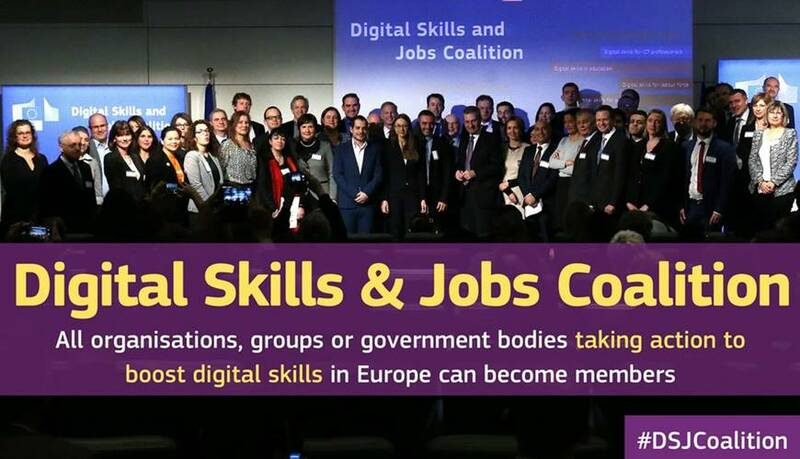 The European Commission has launched a new Digital Skills & Jobs Coalition. This will help Europe meet the high demand for digital skills which are essential in today’s job market and society. Millennia2025 WePROMIS® Pledge is part of it and took part in the Launch Conference: with Caterina Berbenni-Rehm, Deputy Prime Minister of Belgium Alexander De Croo , EU Commissioners Günther H. Oettinger and Tibor Navracsics. Building on the positive results of the Grand Coalition for Digital Jobs 2013-2016 and the EU e-skills strategy, and in coordination with the work under Education and Training 2020, The Commission will bring together Member States and stakeholders, including social partners, to pledge action and to identify and share best practices, so that they can be more easily replicated and scaled up. Accelerating the adoption, deployment and use of Cloud Computing by small businesses (SMEs). CloudingSMEs provides support services to European SMEs, in order to facilitate them in adopting and fully leveraging the benefits of cloud computing services. CloudingSMEs is driven by a vision for the optimal adoption and use of cloud computing within SME communities, and by a set of road maps aiming at the realization of this vision. PROMIS@Service has entered in alliance with, and in solidarity to the “Millennia2025 Solidarity-Women” action developed by the Millennia2025 Women and Innovation Foundation (PUF), sharing the WePROMIS® eMentoring platform to support and advise women in precarious situations among others, through eSkills. The Millennia2015 community counts 1.505 contributors in its Think Tank, 3.827 members and 10.299 contacts in 133 countries or regions in February 2014. Key values of the Millennia2015 “An action plan for women’s empowerment” (www.millennia2015.org), organized by The Destree Institute with the patronage of UNESCO and the United Nations, are the equality between women and men, the respect of rights and diversity, the development of the human capital and the digital solidarity in order to empower women. The Millennia2015 process, built with its international partners, is structured through three phases: “Information transfer”, “Knowledge process” and “Intelligence platforms”. The Millennia2015 foresight research process acts in a view of digital solidarity with those who do not access communications tools and who nevertheless are drivers of changes. With WePROMIS® as eSkill enabler instrument, the alliance between PROMIS@Service and the Millennia2025 Women and Innovation Foundation objective is to achieve these concrete actions and action plans in favor of women and girls in the concerned countries, for their empowerment and for gender equality. TOSCA (Total Operation Management for Safety Critical Activities) is concerned with the integration of industrial operations into a total performance management system so that concerns about safety, quality and productivity are addressed in an integrated way during life-cycle of a project or a product. The industrial domain of application regards process control industries (e.g., chemical industries, power generation, offshore oil & gas platforms, etc.) that may vary in size, regulatory and cultural aspects. TOSCA will examine vulnerabilities of the technical, human and organizational systems that may have an impact in safety, quality and productivity. Safety critical activities can be seen as ‘projects’ or ‘safety cases’ that must be examined from the perspectives of many stakeholders (e.g., different departments, subcontractors, regulatory authorities, etc) and decision-making at different organizational levels (e.g., top managers, supervisors and operators). A participative approach is required that should collect knowledge from the sharp-end operators and integrate it with formal descriptions of how the system works and how responses should be coordinated across the whole organisation. Furthermore, TOSCA should enhance the management of changes and provide a facility for testing out the effectiveness of the possible action plan devised. The overall aim of the PROMISLingua Project was the translation, localisation and implementation of the existing PROMIS® online service (at that time available in English, German and Italian) in additional six languages and markets (Spanish, French, Portuguese, Greek, Romanian, Hungarian). The project aimed at shortening the time-to-market of PROMIS® and delivering a cost-efficient and easy-to-use Internet based Compliance service for Safety, Health, Environment and Quality (SHE-Q) management via multilingual translation and innovative support services to SMEs. The PROMIS® technology system was enhanced and customised to multiple languages with online automated translation systems, Machine Translation, structuring of content, cross-lingual information retrieval.